Others take time to absorb and appreciate especially when, for many of us, PBP occupies a small space in between a flurry of other activities and responsibilities. It also happens after an intense period spent building our stamina through longer rides, including a full brevet series and summer training. 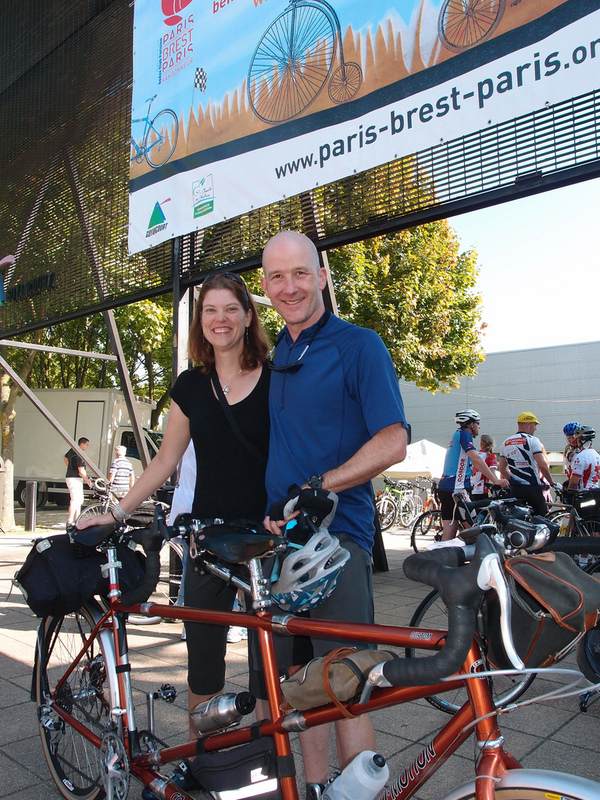 Because PBP is yet again peering around the bend– 2015!– I’ve been revisiting my first trip to this great event. Today takes me back to the 90-hour start, which began around 6 p.m. 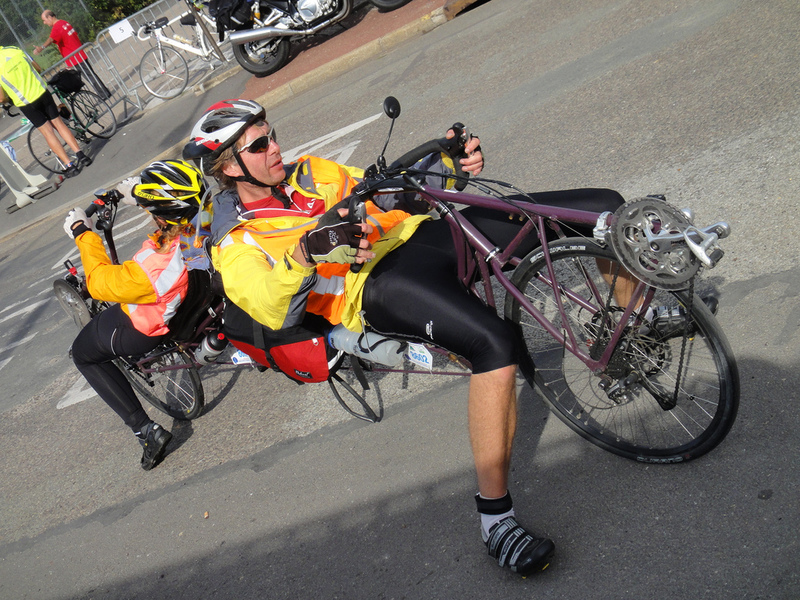 The “special bikes”– such as tandems, recumbents, and velomobiles– launched first. 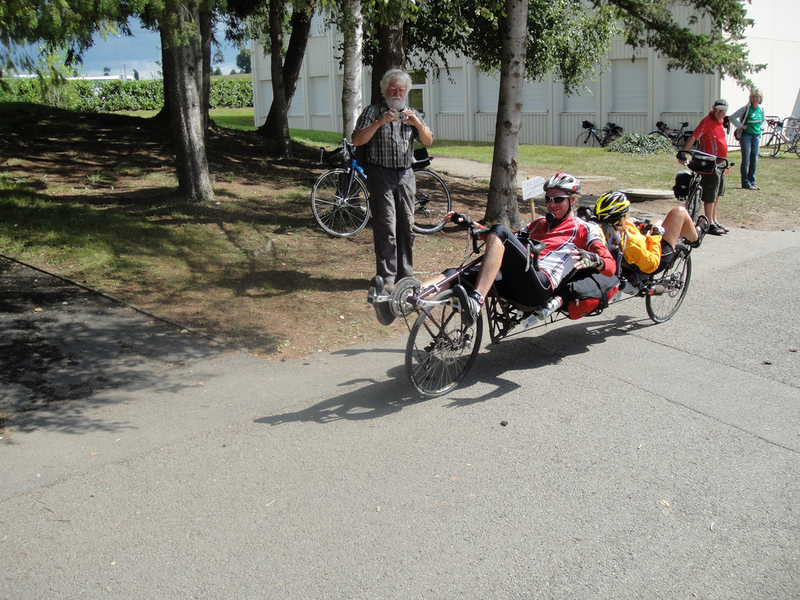 Back to back recumbent tandem. They took the 84-hour start. This was also true of the 84-hour start, where Felkerino and I were one of only three tandems among the special bikes. This was not the case for the 90-hour group. Dozens of tandems lined up. According to the PBP-2011 results, 42 tandems (84 riders) were part of the PBP field. What a sight, all of these diverse bicycles in one place. Big multi-day events like RAGBRAI have their share, but many of them are not tested randonneuring machines, like the ones you see on PBP. Tandem trike and matching pink caps. Mark & Arabella. 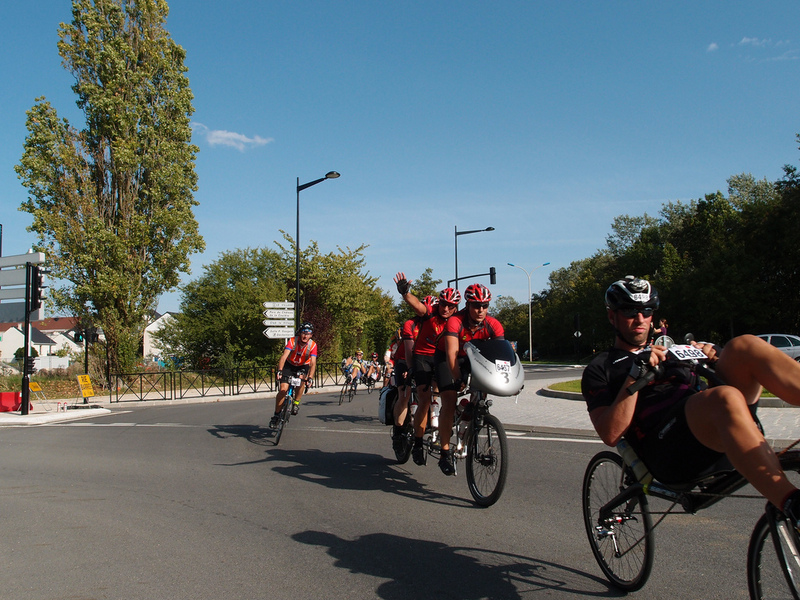 It wasn’t just the riders and tandems from all parts of the world, but the luggage used for the journey. 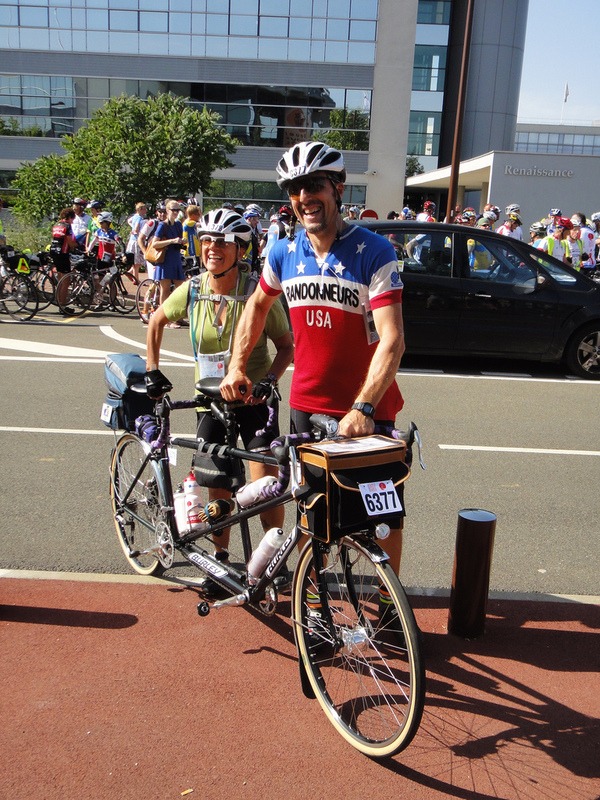 From panniers to Berthoud bags, it covered a wide range of choices. 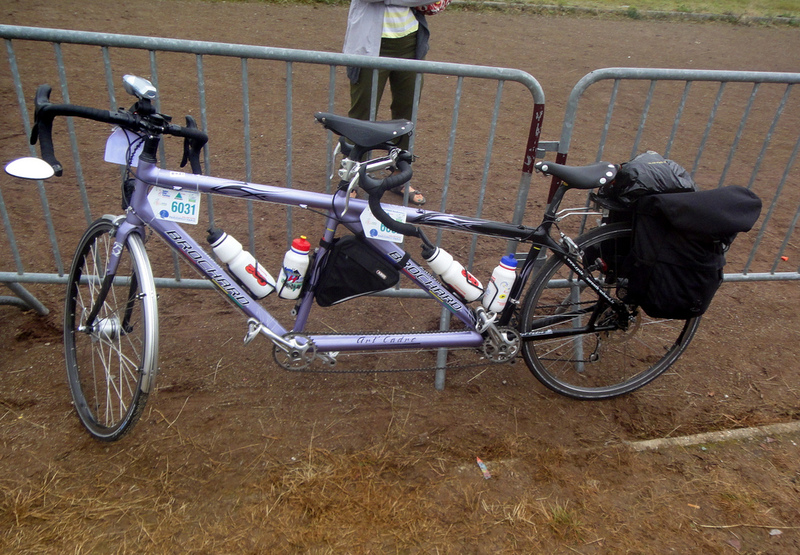 We saw some builders that were familiar– Co-Motion, Cannondale, Bilenky– but many of the tandems that flew past were not any I had seen before. Another interesting aspect to PBP is that it does not require riders to wear helmets. I’m not saying that for any other reason than it is not something that would happen on a domestic randonneuring event or even most organized rides. It gives the riders a different look than I’m used to seeing. 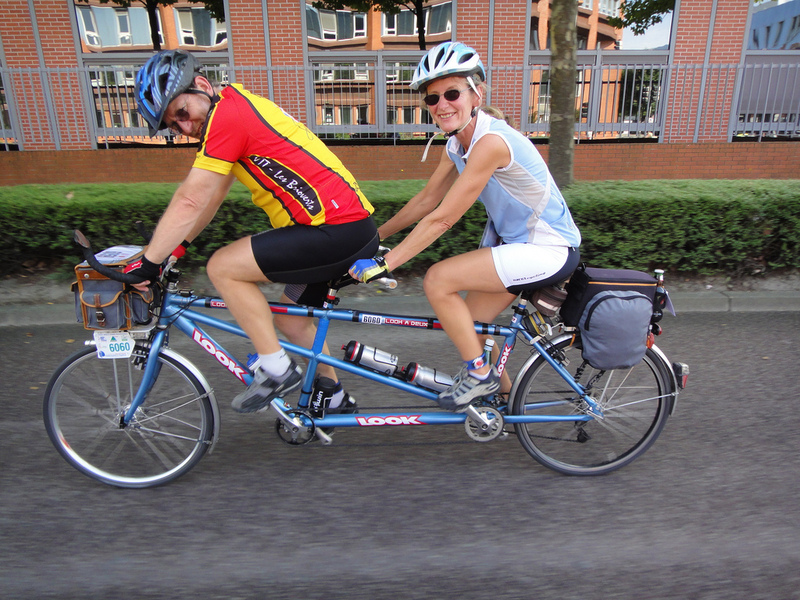 Patrick and Cecilie from Philadelphia on their Bilenky tandem. I believe they were honeymooning on PBP. I hope you enjoyed this PBP 2011 Throwback Thursday, Tandem Style. Yes, I said Throwback Thursday. 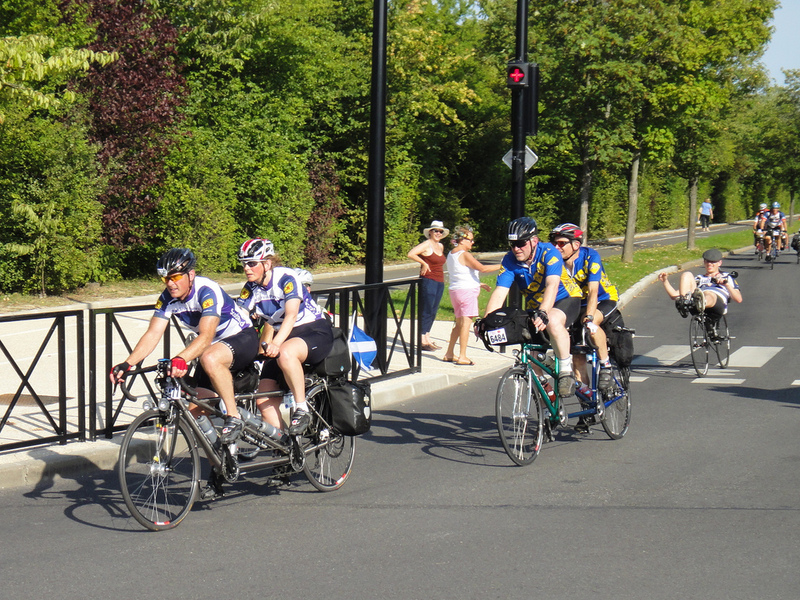 Oh, and please let me know if you recognize any of the bikes (and/or riders) in the pics. 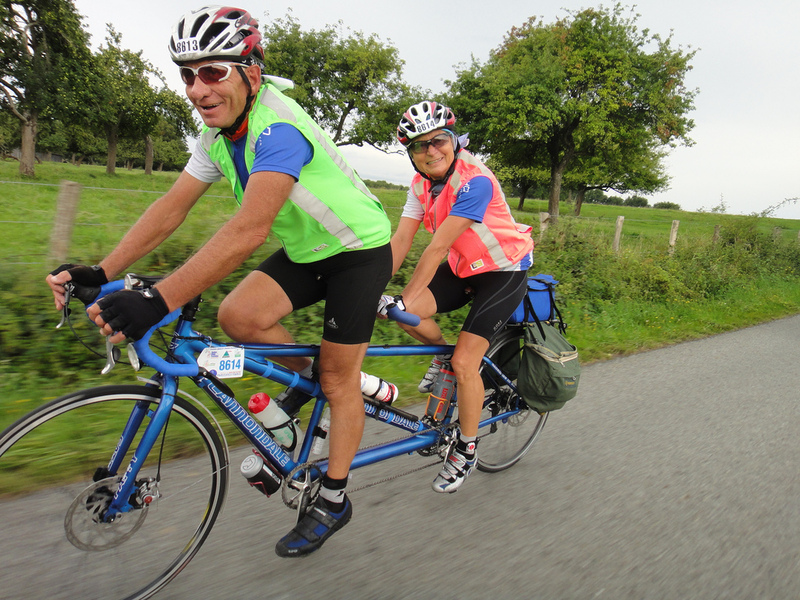 An unscientific survey suggests about a 60/40 split in favor of matching jerseys on Tandems. But I can’t recall ever seeing you and Felkerino go that way. As always, it’s fun to read your observations of the sport. 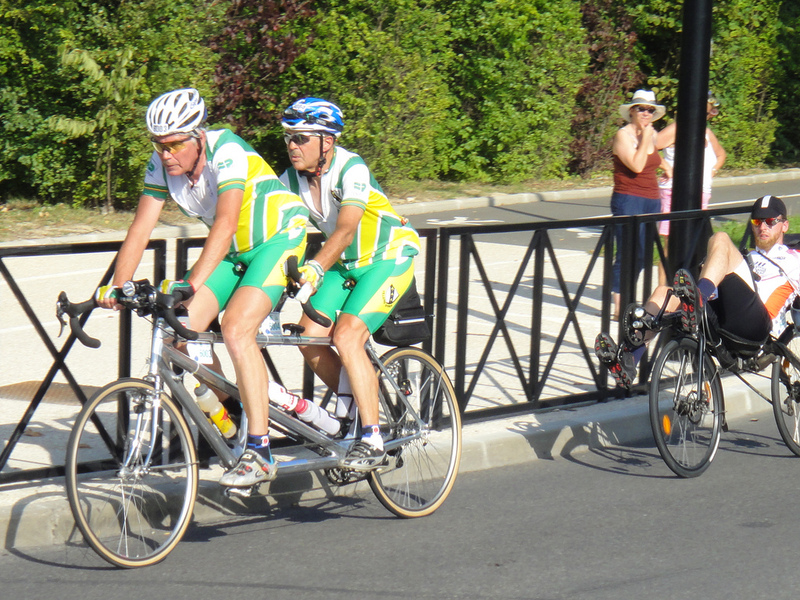 That’s the excellent Colin and Sonya Crawford in the Audax Ecosse Jerseys in the last photo. 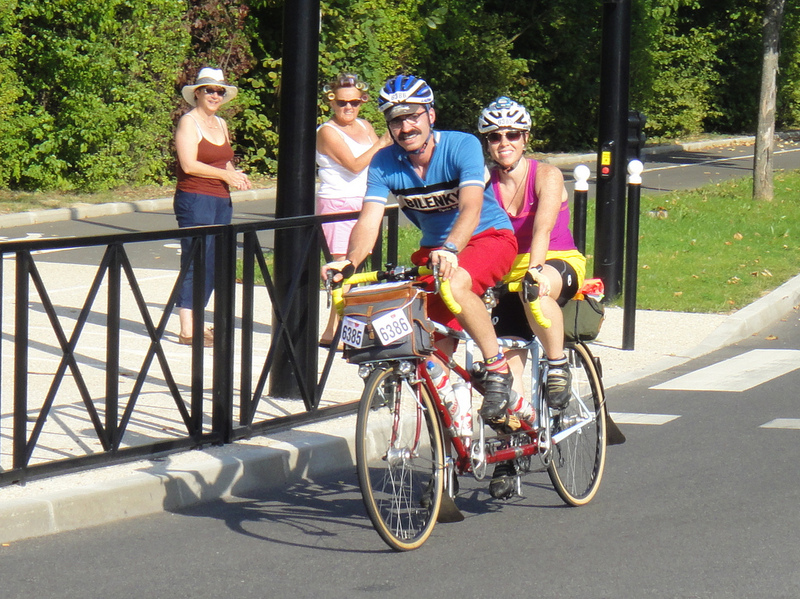 They’re riding a custom coupled titanium Santana – the single most expensive bike I have met. I can’t remember their names but the other tandem team in that shot are from VC167. The VC167 is captained by Andrew Sinclair with stoker Steve Bateman. 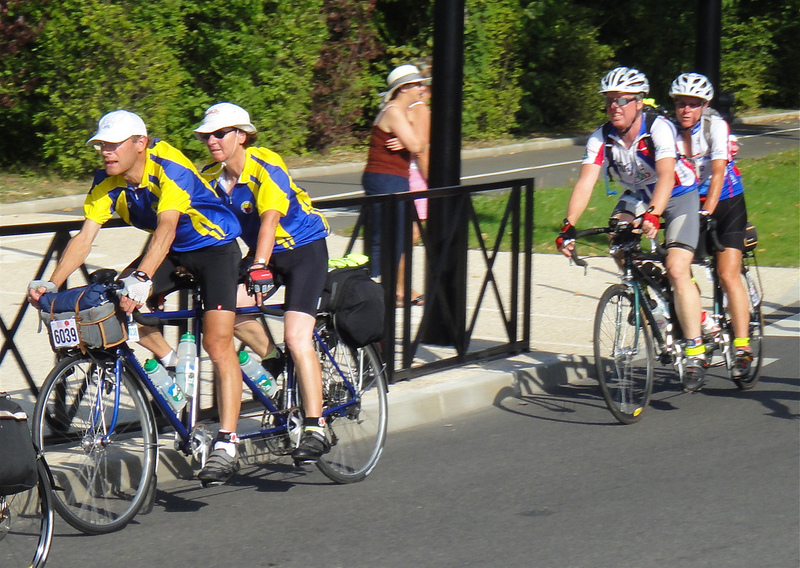 They looked after Colin and me after we embarked on PBP 2011 five days after I was diagnosed with cancer. It was an amazing experience with so much kindness from many people. This post made me think of your conversation a few years ago with Joe Platzner which started the great Coffeeneuring Challenge. As a result, I loaded up my stove, cup and some coffee this evening. Time to start some serious unracer training….. Location: Coffee Shop Without Walls – campus of Messiah College, PA. Covered bridge near Starry Fields. Ride Details: Given my serious lack of training for this year’s challenge, I found myself quite limited in available brewing supplies. So, instead of a nice cup of specialty coffee brewed atop a Trangia stove, I made due with Folgers Singles and my MSR Pocket Rocket. Even with these near critical challenges, the brew was still pretty darn good in the cool evening air. Lovely! I’m looking forward to another edition of Coffeeneuring this year; and the Coffee Shop Without Walls category is a favorite of mine.